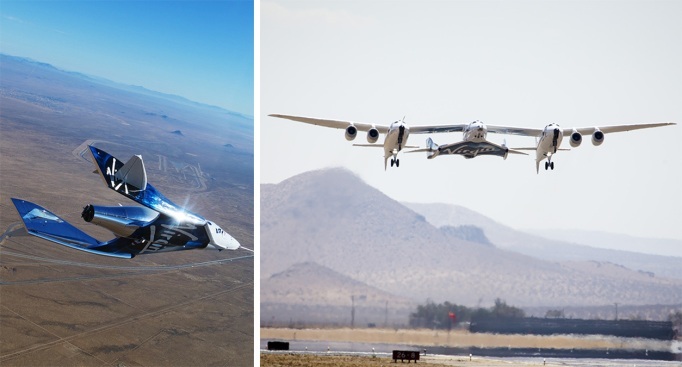 Richard Branson's Virgin Galactic says its tourism spaceship climbed more than 50 miles high to the threshold of space Thursday in a test flight over Southern California's Mojave Desert. The flight is a major step toward the long-delayed dream of commercial space tourism. The test flight began early Thursday with two pilots taking Virgin Space Ship Unity high above the test facility in the desert. It reached an altitude of 51 miles before landing minutes later, said mission official Enrique Palermo. CEO George Whitesides said the goal was to exceed the altitude of 50 miles, which Virgin Galactic considers the boundary of space. Whiteside said that's the standard used by the U.S. Air Force and other U.S. agencies. That differs from a long-held view that places the boundary at 62 miles. But Whiteside cited new research that favors the lower altitude and said that as a U.S. company it will use the U.S. standard. Reaching the threshold of space demonstrates significant progress toward the start of commercial flights that were promised more than a decade ago. Virgin Galactic's development of its spaceship took far longer than expected and endured a setback when the first experimental craft broke apart during a 2014 test flight, killing the co-pilot.